You get a standard motor size, standard cutting capacity, adjustable stops, all the usual features and characteristics you’ll find with saws that are twice the price. For those that think budget-level circular saws can’t handle all that much, think again. While it may not have the appearance or statue of other saws that one may usually consider being professional level, the Hitachi C7SB2 far outperforms its price range. It’s actually hard to see where Hitachi was able to shave any costs off. You get a standard motor size, standard cutting capacity, adjustable stops, all the usual features and characteristics you’ll find with saws that are twice the price, or more. So, if you’re new to circular saws and need an affordable option as an entry point, this may very well be it. In fact, this should be it. Read on to see why. The C7SB2 uses a combination of innovation and smart features to produce a lightweight saw that performs well in conventional woodcutting situations while ensuring better handling and comfort when possible. The 7 ¼ inch saw uses a powerful single-phase 120-volt, 15 amp motor that can generate a no-load speed of 5,800 RPM, and an overall output of 2,100 watts. This fast blade speed and high torque let you easily slice through basic work pieces in seconds without any strain at all. The saw includes a 24-tooth, carbide-tipped blade with a 5/8-inch arbor that handles most tasks with surprising ease. It provides a 1-27/32" depth of cut at 45 degrees, and a 2-3/8" depth of cut at 90 degrees. Cutting depth can be quickly adjusted using the front-located lever. The saw can quickly make accurate 90-degree cuts, and also provides clean bevels from 0-55 degrees with most any material. An adjustable lever lets you easily find bevel stops at 0, 45, and 55 degrees, which helps keep the saw’s blade true and precise by locking the blade in place at the desired angle. An integrated blade guard protects your hands while performing any angled cuts, while a spindle lock provides an extra level of safety. In addition, the C7SB2 is made using a one-piece die-cast aluminum alloy base with easy-to-read front and side scales to encourage accurate measurements each time. Control and handling are improved thanks to a soft elastomer-grip handle, combined with the saw’s low weight of only 10.1 lbs. As for longevity and maintenance, an easily accessible carbon brush allows you to quickly replace the brush whenever the needs arise, significantly prolonging the life of the saw. Oh, and the C7SB2 includes a five-year limited warranty and a hard carrying case for safe transport and storage. There’s a lot to appreciate here in terms of both value and overall performance. For one, the saw’s low weight of 10.1 lbs gives it a nimble feel, but without making it feel cheap or flimsy. This makes it easier to use for longer periods, and of course hauling it around as well. And despite its smaller size and weight when compared to similar circular saws, it still boasts the conventional 15 amps and 5,800 RPM that you get with saws that cost two or three times more, sparing no cutting power whatsoever. It’s also very easy to make any adjustments, whether it’s the cutting depth, bevel angle, or really anything. I also love the way the saw feels in regards to how the handle is set up, and the weight distribution. It really feels solid all around and has a low amount of noise and vibration. For a circular saw under $100, there are going to be a few trade-offs, although they are very minor. The most noticeable thing missing from this saw is an electric brake. Once you’ve finished cutting, you do have to wait for several seconds for the blade to stop spinning, which can be bothersome when trying to go from one workspace to another in quick fashion. The saw’s included case is appreciated, but it’s a little small, and it takes an effort to figure out how to wrap the cord right to fit everything inside. The case doesn’t have a place for the wrench or rip fence, so you’ll have to put those elsewhere. This is not an ideal saw for heavy contracting use, even though it can hold up to some heavier work pieces and cutting duties. The lack of a brake hinders its abilities when trying to work with a number of pieces. 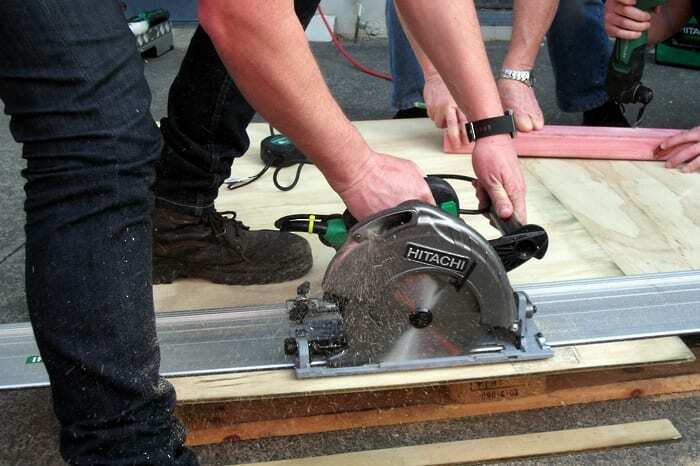 While it may not be the best for professionals, an entry-level use who needs a reliable and versatile circular saw for home project use will definitely find this to not only be a great value, but very easy to use, and more than equipped to take on basic projects. 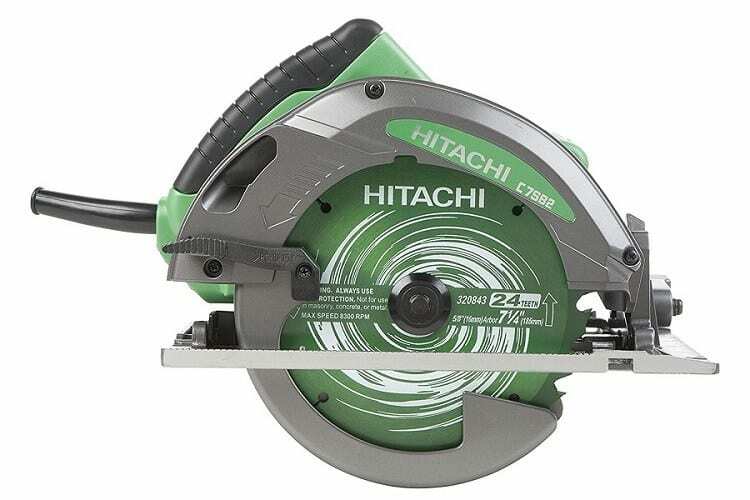 While it may not be a true job site workhorse, the Hitachi C7SB2 is a very affordable option for the DIY enthusiast that is just getting started, or simply needs an economical choice for a circular saw to add to the shop. The saw’s power, adjustability, and easy handling all combine to make this a formidable saw for simple tasks, while still having the capabilities to handle tougher sawing jobs when needed. If you’re trying to keep things well under $100, this is a clear choice.